Savor the full flavor of the finest fusion food and wine. Each dish is a piece of art created by our great chefsâ€™ pallets. Enjoy the spectacular Andaman sea view from the five stars restaurant. At Maya Restaurant, you will find the exquisite Thai cuisine combined with the exotic Thai herbs and spices to create the dining experience you will not forget. The hotel will impress you the superb selection of restaurant available, breakfast at Maya Restaurant served the American breakfast. And Asian dish buffet serving from 07.00 â€“ 10.00 Hrs. Enjoy the A la carte at lunch time with the favorite Thai food & International delicacies at Runtee Coffee Shop from 10.00 A.M. 22.00 P.M. Fill the moonlit night with the romantic dining delight at the luxury boutique lounge with your beloved one. Fine dinning and a spectacular view of Tonsai Bay, witch offer a range of seafood, tradition Thai foods, Asian and Western food, exquisitely prepared continental cuisine and a la carte selections are available for elegant evening meal from 05.00 P.M. - 12.00 P.M.
Offers a quit retreat in which to sit back and enjoy the day and offers a fun, friendly atmosphere, and of course is always a popular meeting place, serving up light meals, favourite cocktail and drink throughout the day you can choosing the new choice form our six private VIP rooms from Wanglong Karaoke which Thai song and international song. This is Phi Phi Village's largest pool. The Phi Phi Cabana Hotel free-form swimming pool perfectly frames one of the best views on Phi Phi Island, Loh Dalum beach. Relax hear on a day bed and take in the sounds of the tropics and grab a drink inbetween plunges into the cooling pool. There is kayaking from the Loh Dalum beach and the next bay, Monkey Beach is a realistic 12-14 minute paddle and a wonderful afternoon out. Many afternoons a game of beach volley ball gets going down by the beach. Visit the reception to book your time on the tennis court. The basket ball pitch is popular. Phi Phi Cabana Hotel has the premier meeting and conference facilities on Phi Pih Island. 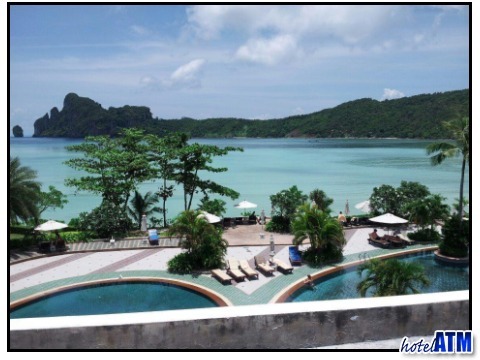 Phi Phi Island MICE is not much advertised but where work has to be organized in a social setting this could be the place for you. The Andaman Ballroom, Width 19.40 M, Length 27.10 M, Height 7.50 M will take upto 500 people for cocktails and 300 people for a theatre set up and 200 for a classroom design. Bida 4 Room and Bida 1 Room, Width 7.8 M, Length 8 M, Height 2.80 M will take up to 60 people for cocktails and 80 people for a theatre set up and 50 for a classroom design. Use the Contact page directly with your company needs.